Dorm shopping at DormCo is simple and super convenient since we’re your one-stop shop for all your college shopping needs. We hope you take some time to browse the site so you can find everything that you’re interested in and require for college life. However, we also know that you’re busy. Shopping itself, whether you love it or hate it, takes time, even if you’re shopping right from the convenience of home. So if you’re just starting out with your college shopping, we can get you on the right path while keeping it a quick process. The first thing you’ll need is XL Twin dorm bedding. Without a college comforter, some dorm sheets, and a few bedding accessories, you literally won’t be able to sleep while you’re in college. 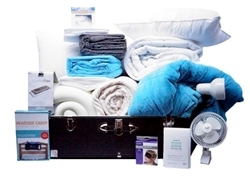 While DormCo prides itself on its vast selection of college bedding needs, we’ve got our bedding supplies distilled down to a variety of packages that you can easily and quickly customize for fast yet thorough dorm shopping. Sure, you can go through one-by-one and purchase these items separately, but buying them as a package will save you money and time! Get things started with our 5-piece package entitled The Essentials. You’ll select your sheets and dorm comforter first, and then you’ll pick out a bed topper, mattress pad, and underbed storage organizer. We call this kit The Essentials because you might be able to sleep without them as part of your dorm bedding...but you just won’t sleep very well! For example, if you neglect a bed topper, you can expect to wake up with back pain. That’s right, even though you’re a college student, your young age won’t protect you from the discomfort of that old, university-provided mattress. A bed topper will add that necessary layer of softness, while a mattress pad adds even more softness and can keep that valued bed topper covered and protected. If you upgrade to other college bedding kits such as The Premium Package or The Mega Plush Package, you’ll add even more comfort to your college bedding, and even some convenience as well. Perhaps you’re wondering how bedding supplies can be “convenient.” Well, you can really start to realize what college beds and dorm rooms lack when you think about it. Since there will be no nightstand, for example, these kits include bedside shelves as a convenient addition. The Mega Plush Kit even comes with a dorm trunk! More than just enhanced suitcases, dorm trunks have a ton of uses once they’re inside your dorm room. They can also help keep your dorm more organized since they increase storage space. If you want to put a big dent in your dorm shopping on the whole, check out our 19-piece kit, entitled Only The Best. Your college bedding needs will be taken care of, and you’ll get some extra dorm stuff to help you sleep better and make dorm life more convenient. You’ll receive a clip light and clip fan, which make that trusty old bed a better-lit place for reading and studying, and, thanks to the fan, a “cooler” hangout spot too. There’s also an ever-handy eyemask and some earplugs included—on those days when you can actually sleep in, you won’t want to have any nuisances keeping you awake!